NOTE: There are two basic sizes of AR-15 receiver extensions (buffer tubes): mil-spec and commercial-spec. Please make sure you know which one you have. 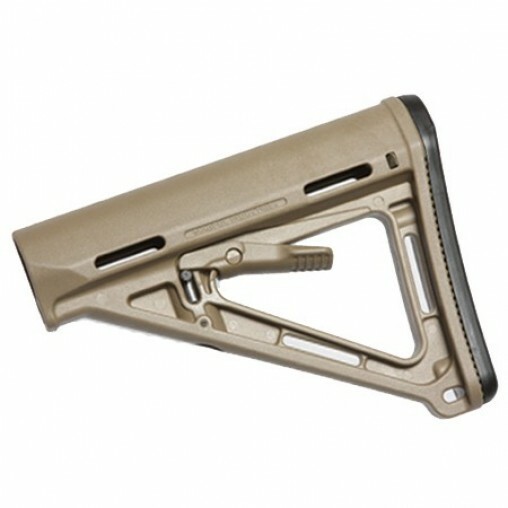 This FDE stock was the perfect color match for other components that I had. Typical MOE quality at the best price I could find. Shipping was quick and free. Good folks to buy from. Good quality stock and Toms Tactical has prices that can't be beat. Shipping was fast and customer service is great. Magpul makes amazing stuff and this is no different. During my recent AR build I made several purchases from Tom's Tactical. All were shipped out promptly and the free shipping kept the costs down. Thanks!